There is little to say again how tasty and healthy avocadoes are. Since we can find them all year round, try and find some crab meat, and you will able to reproduce this easy Japanese cuisine-inspired recipe:. I’m sure you will expand on it! -Take crab meat out of tin with its water (will add taste!) 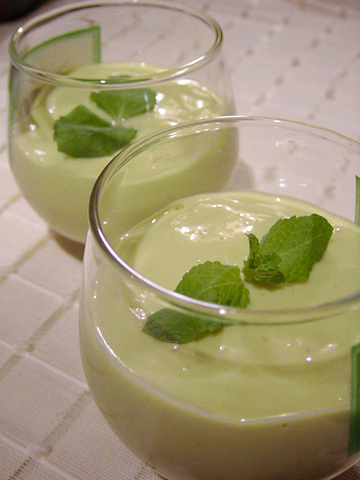 and drop it in a bowl with mozzarella cheese, onion, mayonnaise, lemon juice, grated wasabi, salt and pepper. Try to experiment with quantities!. Mix well. 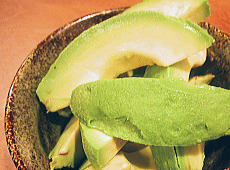 -Cut avocado in half(ves) and discard the seed. 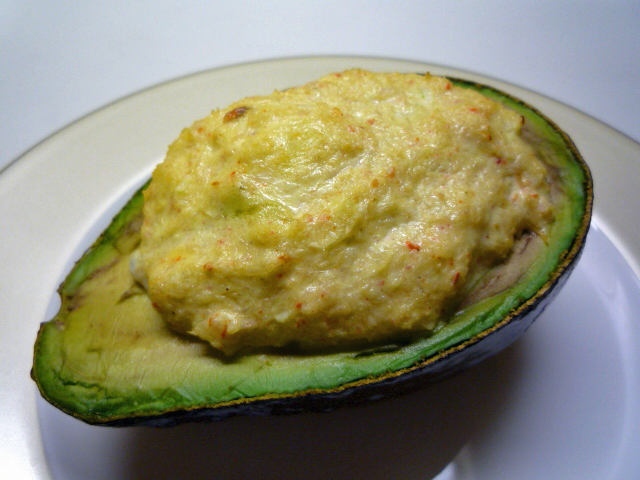 Fill each half of the avocado with half of the crabmeat sauce. -Bake in oven at 200 dgrees Celsius for 15 minutes. -Eat it hot! 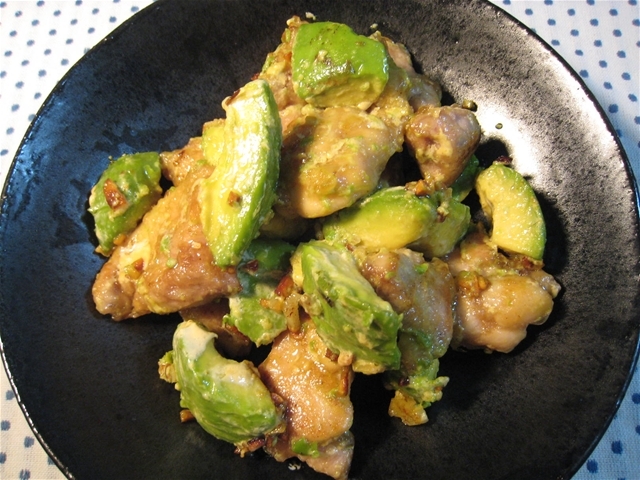 Hot avocado is suprisingly tasty, so have this appetizer in cold weather! 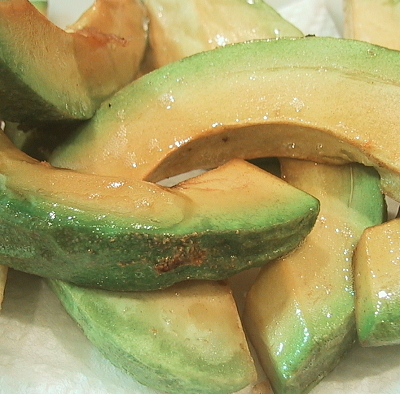 Avocadoes are popular, plentiful and becomeing cheaper. 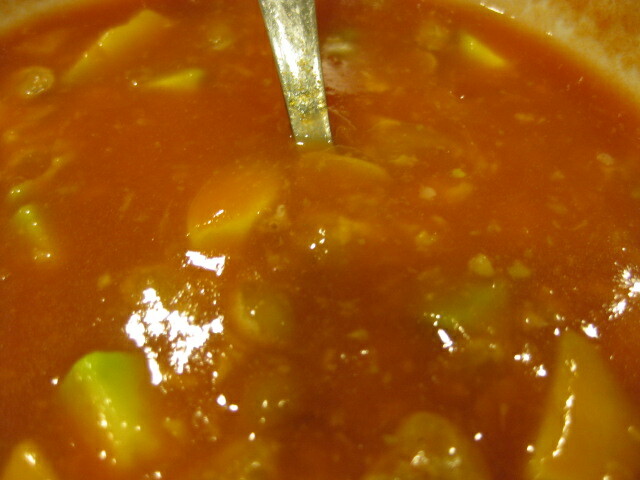 Here is a hearty and delicious, but simple recipe for a refreshing soup, especially in hot climate. Bear in mind you will have to check the Chicken Bones Soup Stock recipe first! Cut them cleanly and throw seed away. Peel carefully and cut into quarters. 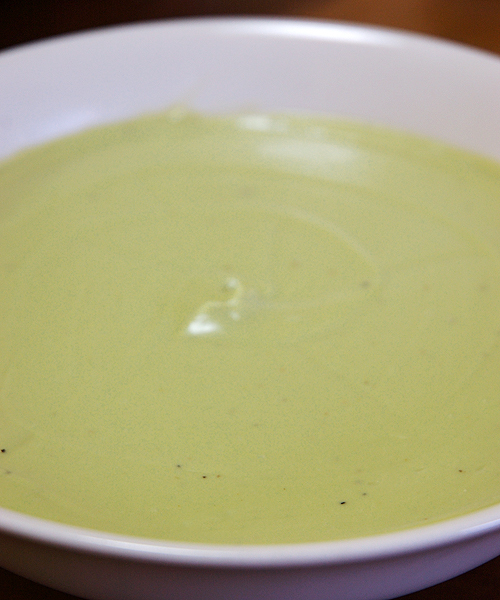 Drop the avocado quarter into a large food processor. Add the chicken bones soup stock. A cup is the right amount. More, and the taste will greatly vary! As for the yoghurt you can add mre if you really wish to. Add salt and pepper (and optional spices). Process quickly to mix them in. Check taste and rectify if needed. Serve in glass plates or bowls. 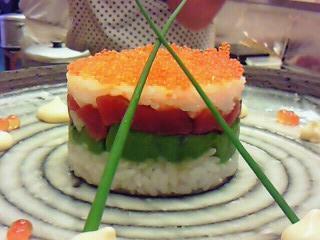 Do think oabout the presentation! Avocado’s hard! No worries! Deep-fry it! Coming back to a comment and question about what to do with an avocado you peeled away before realizing it was to hard to prepare for your California Roll, Avocado Soup or Avocado Salad, there is no need to worry. No worries! as they say in Australia! The same Australians might be tempted to tease you with a few jokes of their own. A habit they have is to scream “good nut!” when one of their bowler throws an excellent ball to a befuddled batsman during a cricket match. The same “nut” could be rightfully construed to another word meaning exactly the same when our yankee friends play “hard ball” at Baseball! I can hear some of good-natured friends saying that once again the old geezeer is laying on it heavily, but have you heard of the real meaning of the word “avocado” in its country of origin? About time I stop, or some unwanted spammer will find his/her/its way in! Alright, you found out your avocado is too hard. Cut it into appropriate “wedges”. Sprinkle them with a little salt and deep-fry them as they are for 2 minutes at 180 degrees Celsius. Serve them with a good beer. You’ll find they are crispy outside and so sogt inside! You could sprinkle them with a little lemon juice or some chili powder for more taste. Plenty of possibilities here. Great snacks for our vegan friends! Here is another idea as a summer salad I have just fished out one of my recipe notes. Although Carpaccio should only apply for beef, indulge the old geezer as far as names are concerned! LOL. -Press the juice out of the green lemons in a bowl. Cut passion fruit in two and strain over the lemon juice to take pips out (discard. You may keep a few for decoration, though).Mix. -Cut scallops into thin slices and place on a large dish with space betwen them. -Peel the avocadoes. Cut them in two halves. Dicard nut. 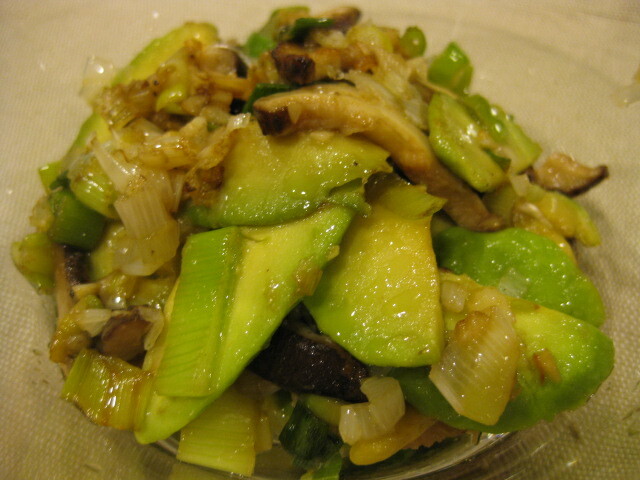 Cut avocado into thin slices and place between scallops slices. -Season with salt, freshly ground black pepper, and the lemon/passion fruit juice. Sprinkle with olive oil. Cover with cellophane paper and leave iside refrigerator for 2 hours. 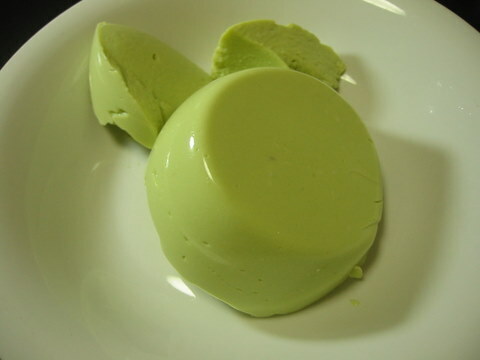 -Before serving, thinly cut sweet basil and decorate dish with it. Best savoured with a dry white wine!